In my class, I have several bins of animal books, which range in quality from Kate DiCamillo's excellent works to the Animal Ark series, about which the less said, the better. I'm happy to have another quality book to add to the bins. Something that has come up a lot in my recent reading is helping my students balance their desire to grow as readers and read all the 'hot' books like Red Queen, and what is actually appropriate for them. A lot of the time, when they finish a heavy series, they feel unmoored and want something light and safe. A palate cleanser that reminds them that the whole world isn't a dystopia. 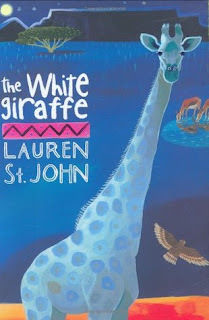 Lauren St. John's The White Giraffe is a book I could hand those students. After the tragic death of her parents, Martine moves to her grandmother's wildlife reserve in South Africa. It is there that she learns the legend of the white giraffe and realizes that she might have some special gifts when it comes to healing hurt animals. A white giraffe is the rarest animal on earth, so Martine must protect her new friend before poachers can harm him. I might be accused of being overly sensitive, but I was slightly uncomfortable about this white girl moving to Africa (almost always referred to that way, not referring to the specific country where it is set) to be a savior to the animals. While the setting is authentic, I wish that Martine had made friends with people of African heritage. Overall, it has a good mystery and won't feel 'babyish' to my animal book lovers. There are more books in the series which I will add to the collection if this novel is popular.